What Makes a Wi-Fi Device “Wi-Fi”? Your fave smartphone or tablet will often support a number of different wireless technologies. Most people have heard of “Bluetooth”, “Wi-Fi” and “cellular”, but what is the difference between them? Wireless is wireless, right? In addition to those mentioned above, there are also other lesser-known wireless technologies such as “Zigbee” and “Z-Wave” that you may also find in consumer-grade and commercial devices. Each wireless technology has its applications, dependent upon its capabilities. Cellular technology is used primarily to provide cellular phone services around towns, cities and highways. Bluetooth, Zigbee and Z-Wave are used to provide close proximity services for devices such as wireless headsets, keyboards, door entry systems etc. Wi-Fi is primarily used to provide in-building data, voice and video services for laptops, tablets and smartphone type devices. My area of interest is Wi-Fi wireless networking, so we’ll take a quick look at what makes a Wi-Fi device “Wi-Fi” capable. All of the wireless technologies we’ve mentioned previously have earned their wireless technology classification as they have been manufactured to adhere to a particular industry standard. Many of these are defined by an organization called the “Institute of Electrical and Electronics Engineers” (or IEEE, for short). 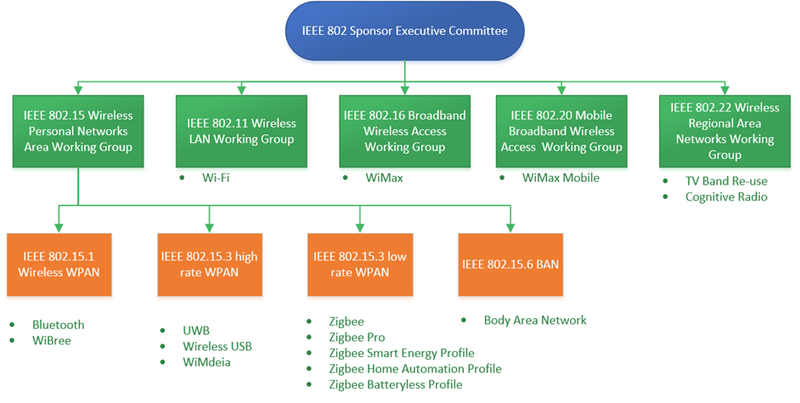 The IEEE define standards that ensure that devices operate to a particular specification to earn their stripes as a “WiFi”, “Bluetooth” or “Zigbee” capable device. Based on these standards, manufacturers of smartphones, tablets, laptops etc. will included chip-sets and software that implements its wireless connectivity using one or more of these standards. Going back to our original question, a “Wi-Fi” device is a device that supports the IEEE 802.11 standard. This is implemented within a device using a combination of 802.11-capable wireless chipsets and software. Which Channels Can I Use On The 2.4GHz Band for Wi-Fi Networks?